Surya(sun)Hurricane(lantern) is an innovative low-cost solar lantern made from recycled parts of the conventional and much used kerosene hurricane (lantern). Women bring used kerosene hurricane to floating solar workshops where a 5 Watt CFL is placed inside the glass globe, which replaces the wick and burner. Next, 12V 7.5 Amp sealed lead battery is placed inside the oil-reservoir. The opening of the reservoir is used as re-charging socket with a switch underneath it. Finally, the kerosene hurricane becomes a SuryaHurricane solar lantern. 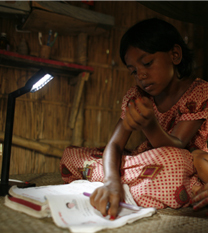 The solar lantern provides families with high-quality light in the evening for children to study and women to do craftwork to earn extra income. People also save the cost of kerosene. No land is required for integrated floating farming, and also less time is needed as fish, vegetable and duck farming are done in three different ways on water. The floating garden ensures the availability of vegetables during the monsoon. It creates employments, develop assets, and improve their quality of life and nutritional status. It helps people to adopt with the climate change induced flooding. During the monsoon season the center collects rainwater using water collector and stores water in the onboard storage tanks, and then supplies the filtered water to the floating schools. PV modules are installed on the boat rooftops, providing between 200 Wp, 600 Wp and 1-2 kWp of power, depending on the electrical demand. The PV modules charge an array of lead-acid batteries through a charge controller, which prevents the battery from being over-charged or deep-discharged, and also include an inverter to convert dc power to ac, thus allowing the use of the electrical equipment on the boat. Boats have PV-powered lighting. The installation and maintenance of the PV systems are done entirely by Shidhulai’s own trained engineer and technicians. The boats are especially designed by Shidhulai Swanirvar Sangstha to adjust to any equipment configuration as well as to protect the electronic equipment from inclement weather, even during the height of the monsoon. Working with area boat builders, Shidhulai has built flat-bottom riverboats using local materials and building methods. They are about 55 feet long and 11 feet wide with a main cabin that can fit 30 children and a teacher. Sitting low in water, they incorporate metal beams to allow for column-free open spaces, flexible wooden floors, higher ceilings, and waterproof roofs outfitted with solar panels. These multilayered roofs can withstand heavy monsoon rains.